Espanyol vs Barcelona – 100 not out? Another Catalan derby and another Barcelona victory but this one was different. Sure, Espanyol have lost to their city rivals before, and by much greater margins, but they have always done so on their own terms. Prepared to have a go at the opposition especially under Pochettino. This was all a little too tame. Aguirre named his usual starting line up for Espanyol with one slight alteration. The normal 4-2-3-1 was abandoned for something more along with line of a 4-4-1-1 with Verdu playing behind lone striker Sergio Garcia. There were a few changes in the Barcelona side with Thiago and Song starting in midfield whilst the forward line was Villa, Fabregas and Sanchez. The game delivered very little except a comfortable Barcelona victory. Espanyol were too meek against their more illustrious opponents. There was an edge lacking from the home side’s play. The side with the worst disciplinary record in La Liga never showed that aggressive side and when Wakaso did, it was for complaining to the referee resulting in his second caution. From the 38 tackles that Espanyol attempted in the game, 23 of these occurred in the first half. As the game progressed, Espanyol fell off the pace. Barcelona coasted to victory without any requiring to hit a high level of form. Despite a very bright opening in which the home side pressed and harassed their rivals, Espanyol soon dropped off. In the 2nd minute, Espanyol pushed very high forcing Valdes to kick long from a goal kick. The hosts pushed high as a unit with their midfield four working very hard to close their opponents down and prevent them from having time and space on the ball to build. Despite the tactic showing positive signs, it was not maintained. 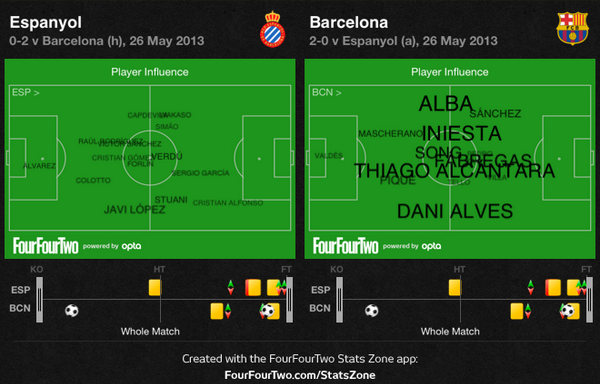 Dani Alves is alone on the right side and yet manages to subdue both Capdevila and Wakaso for the majority of the game. 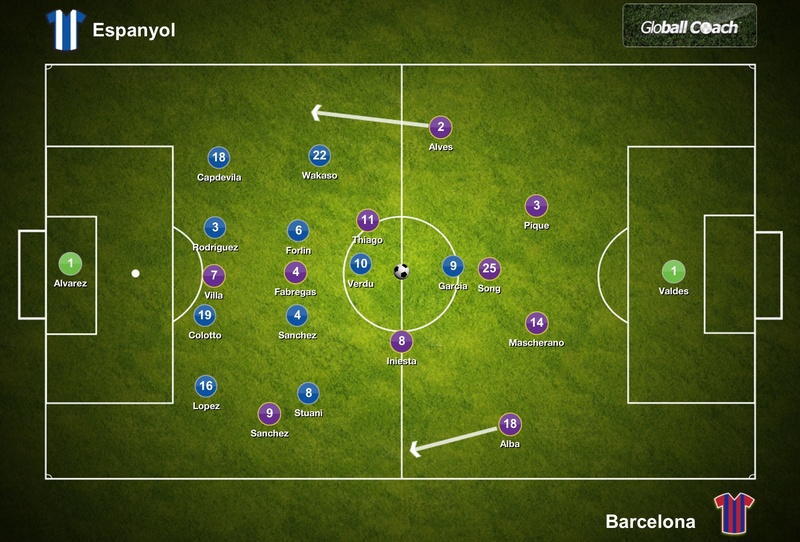 This was partly due to Espanyol deliberately conceding space on the flanks to stay narrow and compact centrally. The problem was, the defence and midfield were compact but Verdu and Garcia are left higher up and disconnected. Sergio Garcia is isolated and was left to chase lost causes on a frustrating night for the striker. The home side moved too deep, too quickly and with nothing to hold on to. This was the main issue for Espanyol. Moving too deep so early on. Despite losing the opening goal to Alexis Sanchez in the 13th minute, Espanyol never altered this approach. The goal itself owes much to the individual skill and determination of Sanchez. In what has been a very poor season for the forward, his goal in the 13th minute was a timely reminder of what he can produce. Espanyol had an abundance of bodies around the forward yet he still evaded tackles and managed to curl his shot into the far corner. 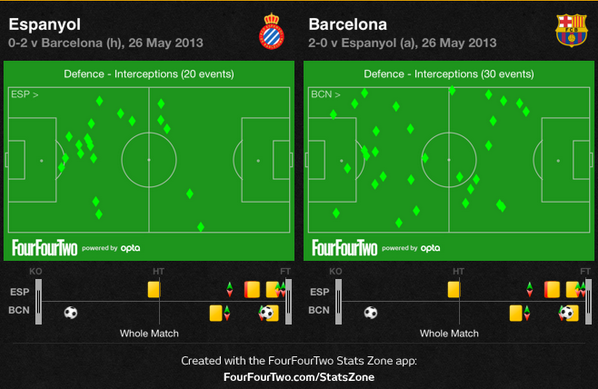 From 20 interceptions, 15 were made in their own half as the side dropped off Barcelona. Beyond that however, 10 interceptions were made in the congested central area some 25 yards from goal where Espanyol were packing bodies. The side remained defensive. Barcelona had space on the flanks from where Sanchez instigated and scored the opening goal. It does lead to questions. Espanyol are safe from relegation but kept a disciplined, conservative approach throughout. Should they have offered more? Should Aguirre have let the side open up? It may have led to a defeat but at least it would have been a defeat on their own terms as opposed to a defeat from a Barcelona side that bossed the game and were seldom placed upon any great pressure. At the very least, the side should have pushed higher up the pitch to offer support to Verdu and Garcia but they never did. The game provided Thiago Alcantara with a rare starting appearance with Xavi on the bench. As the lynchpin of the Barcelona side gets older and as injuries take their toll, Thiago should see more game time to both aid his development and offer Xavi suitable recuperation time. It has not always been like that this season. Xavi has played too often, to both his detriment and that of Thiago to the extent whereby there are now transfers rumours linking the young midfielder with a move elsewhere. Patience, it seems, is not his greatest quality. Let’s be clear from the outset, Thiago is not a natural replacement for Xavi. The young midfielder brings different qualities to the game. More prepared to attack opponents with surging runs forward, he offers a greater vertical threat and less overall game control than Xavi. There is still a slackness to his play at time though. A general lackadaisical attitude when making some passes in non-dangerous areas of the pitch. When you enter the final third, passes will always go astray but in safe areas, this issue must be worked upon. This can be seen with the location of misplaced passes detailed above. The dream, however far fetched it may have seemed given their early season predicament, of European football has ended for Espanyol. In truth, their recent form suggest that once los pericos were safe from relegation, the players switched off. Four defeats and just one draw in their last five games provides evidence of that. The exertions of avoiding relegation appearing to have taken their toll on the side. For Barcelona, there is one game left at home to Malaga in what is likely to be Pellegrini’s final game in charge. Win and Barcelona reach 100 points in a season, breaking their own club record of 99 points and equaling the league record set by Real Madrid just last season. But Pellegrini has spoiled a potential party at the Camp Nou before when his Villarreal side held Barcelona to a 3-3 draw and prevented them winning the title on home soil. And earlier this season, Malaga gained a 2-2 draw at the Camp Nou in the Copa del Rey. Could the Chilean mastermind another performance at the Camp Nou for his last hurrah with Malaga?